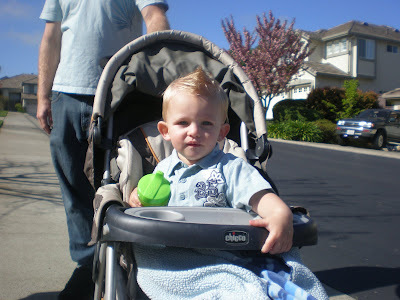 This year we spent Easter with Grandma & Grandpa Drisko. 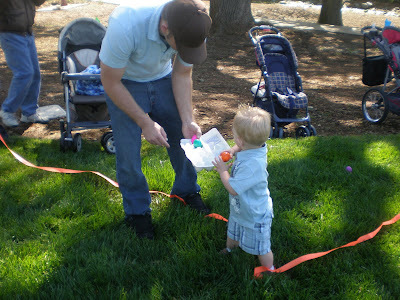 We got up and went to Church and then to the Serrano Easter Egg Hunt. 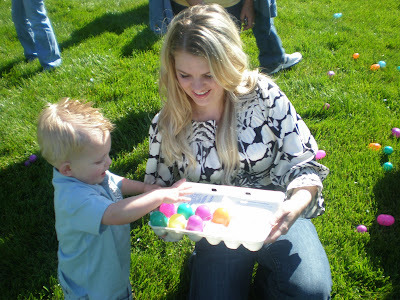 It was so cute to see all of the kids in their darling Easter Clothes. 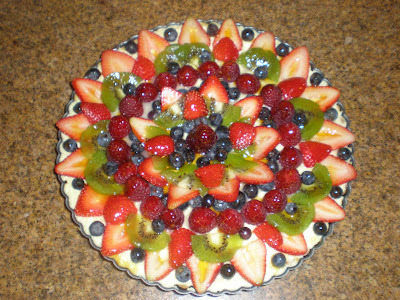 I made a fruit tart for breakfast and it turned out pretty so I took a picture of it. I am such a nerd. 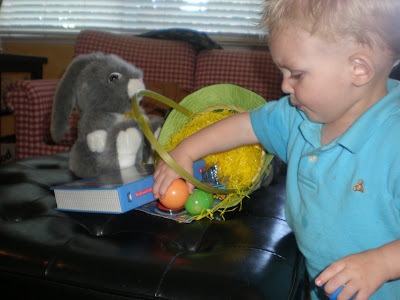 Serrano has a rule, that there are no easter baskets allowed and that each child only gets 12 eggs. 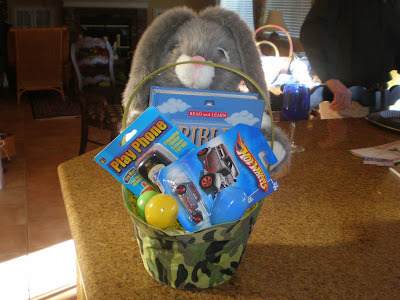 So the cute Cammo basket the Easter bunny brought had to stay at home. Instead everyone had to use an empy Egg Carton. It was a little bit chilly but over all it was a beautiful day. Grandma, Grandpa, Aunt Jill and the 3 of us all went together. 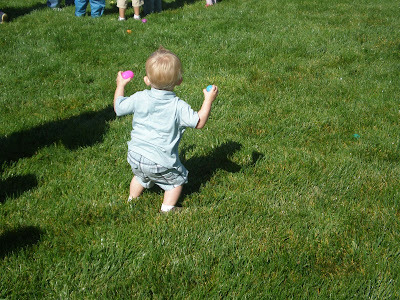 It was Griffin's first Easter egg hunt and at first he just loved looking at the eggs and at the other kids. 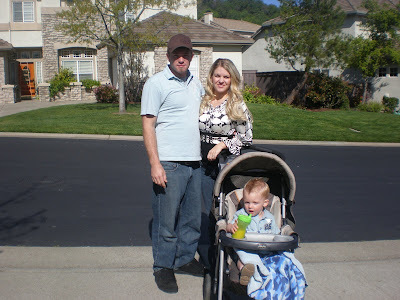 But with some encouragment from mommy & daddy, he decided to dive in and once he did he had a blast. That night I made dinner. We had Duck A'L Orange, wild rice, fresh rolls, Asparagus and spinach, pear and candied waknut salad. It was yummy and something different thanhaving the traditional ham...which we had the week before. ooops! 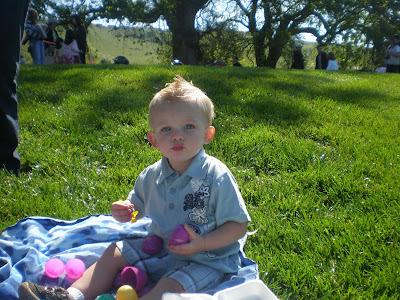 It was my favorite Easter so far. Cute pictures. We were in Salt Lake this weekend and I was wishing you guys were still here. 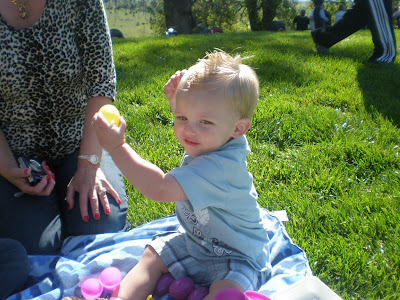 Griffen in so cute. Miss you guys.